What ever Pawan Kalyan does it becomes a sensation. The same thing happened when Power star joined the famous networking site Twitter. 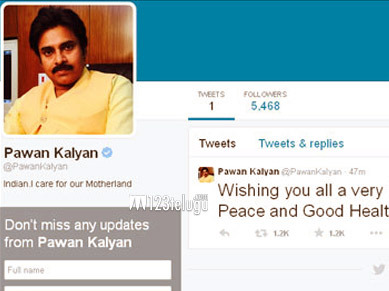 On the occasion of New Year 2015, Pawan joined the famous networking site and wished all his fans. “Wishing you all a very Happy New Year ! Peace and Good Health” tweeted Pawan. Within no time there was a huge roar and a number of his fans followed their matinee idol on Twitter. Pawan will next be seen in Gopala Gopala which is set for a Sankranti release. Wishing you all a very Happy New Year ! Peace and Good Health.